The global game-based learning marketplace is growing and we’re excited to support that growth through new partnerships. 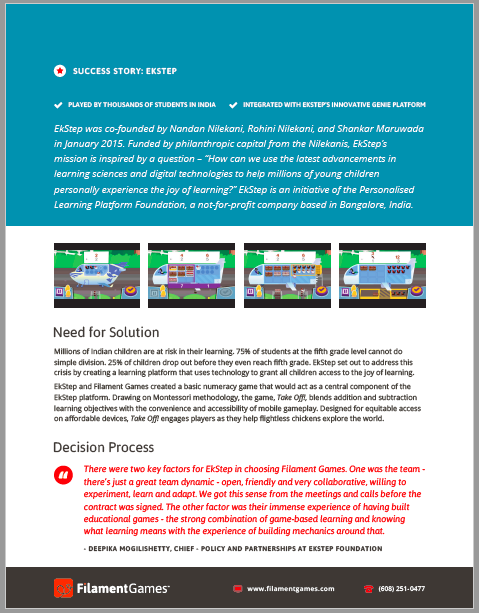 Our partnership with Bangalore-based company EkStep is helping to bring game-based learning to millions of students in India. In India, nearly 75% of fifth grade students cannot do division and 25% of children drop out of school before they reach fifth grade. To support these students, EkStep created a learner-centric, technology-enabled platform designed to improve applied literacy and numeracy skills. We partnered with EkStep to create a basic numeracy game that acts as a central component of their platform. Read the success story below to learn how Take Off! builds numeracy skills while players help flightless chickens explore the world. Think game-based learning would further the mission of your organization? Drop us a line– we’d love to hear about your work!